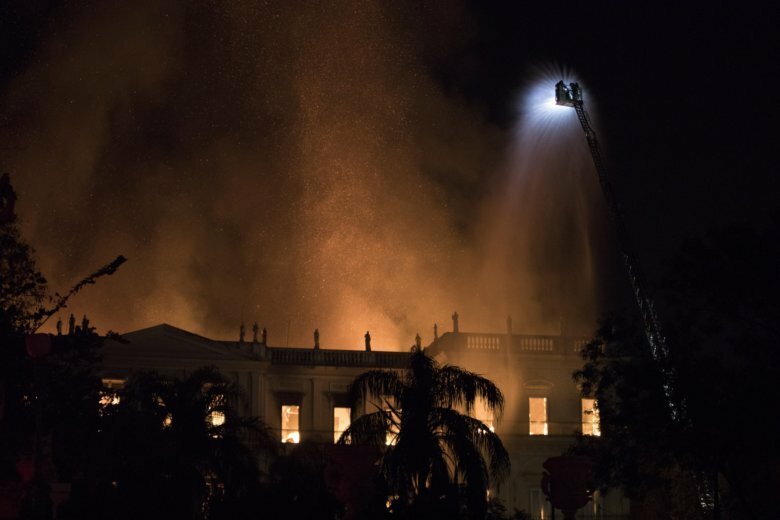 RIO DE JANEIRO (AP) — A huge fire engulfed Brazil’s 200-year-old National Museum in Rio de Janeiro, lighting up the night sky with towering flames as firefighters and museum workers raced to save historical relics from the blaze. The esteemed museum, which houses artifacts from Egypt, Greco-Roman art and some of the first fossils found in Brazil, was closed to the public at the time of the fire, which broke out at 7:30 p.m. Sunday local time, it said in a statement. There were no reports of injuries, the museum said, and it wasn’t immediately clear how the fire began. According to its website, the museum has a vast collection related to the history of Brazil and other countries, and that many of its collections came from members of Brazil’s royal family. Latin America’s largest nation has struggled to emerge from its worst recession in decades. The state of Rio de Janeiro has been particularly hard hit in recent years thanks to a combination of falling world prices of oil, one of its major revenue sources, mismanagement and massive corruption. “Unfortunately, given the financial straits of the Federal University of Rio de Janeiro and all the other public universities the last three years, this was a tragedy that could be seen coming,” Marina Silva, one of the leading presidential candidates, tweeted. “It’s a national obligation to reconstruct it from the ashes, recompose every eternal detail of the paintings and photos. Even if they are not original, they continue to be a reminder of the royal family that gave us independence, the (Portuguese) empire and the first constitution and national unity,” he said. Associated Press video journalist Yesica Fisch contributed to this report from Rio. AP reporter Mauricio Savarese contributed from Recife, Brazil.